When we see a Balinese dance or drama performance, it is inevitable that the feeling of witnessing an ancient art-form arise. The speed, physical and emotional control of the dancers and at some degree an aura of celestial beauty that envelop the air, will bring us to the conclusion that this art-form must have been going trough many human generations of perfection. The subtlety of the beauty and the air of magic of the dance, also suggest that this kind of arts must have been created during a period when materialism still not emerged as a kind of God as it does today. This feeling is for most parts the truth, that is, after we take aside some Balinese dances which are in fact created in modern times. One of them is Kecak, often called the monkey dance, with it’s well known “chack-chack-chack!” oral music, which was created during the colonial period in the thirties by the Balinese, to visualize the imagination of a multi-talented artist, Walter Spies, a Russian born German! Another example is Janger, the dance of boys and girls based on western cabaret brought to Bali by the Dutch during the colonial period of the island. To trace the origin of Balinese dance-dramas, especially in the prehistoric period, is difficult. Without any written text originating before the first millennium, we don’t know how the dancing or performing arts situation was at that time. But based on bas-reliefs found in many candi (temples) and sites in Indonesia and in lontar books (traditional books made of palm leafs) we know that at least before the end of the first millennium this art-forms was practiced in Indonesia. On Bali particularly, dance as well as music has long been a necessity for many religious festivals, and has been for many centuries. One of the oldest Balinese dance-dramas which has written text associated with it is Gambuh. This dance is assumed to be many centuries old, and accompanied with unique musical instrument it displays the dancing and vocal skills of the dancers. The gambuh play is a story from Panji, a kind of chronicle of princes and princesses of Java, that depicts political as well as romantic stories of the courts. It is believed that Gambuh influenced all other Balinese dances that developed in later time. Arja is one example of the dances that is influenced by Gambuh. It is one of the most technically difficult dance-dramas of Bali since the dancers must sing and dance at the same time, a kind of opera. Arja dancers, accompanied by a specific musical instrument called Guntang, often sing and dance intricately and beautifully at the same time, causing this dance to become one of the most artistic Balinese dances. Later, in the nineteenth century, a form of dance emerged on Bali that has become very famous; Legong. It utilizes a specific musical instrument made of bronze, called Pelegongan. Many of the repertoires of this music are derived from Gambuh. The Legong is considered by many as the masterpiece of all Balinese dances of beauty and grace. Kebyar dances was born in early twentieth century by some kind of collaboration of musicians and dance masters from North and Central Bali. It is very powerful and dynamic, and has become the most popular dance on Bali today, also referred to as tari lepas. This dance is accompanied by the equally powerful and dynamic Balinese music known as gamelan gong kebyar. Dances in this group include Solo Baris, Oleg Tamulilingan, Kebyar Terompong, Taruna Jaya, Panji Semirang, Wiranata, and many others. Drama Gong is a form of dramatic arts that is also accompanied by gong kebyar. It emerged around the sixties, and became the most popular dance-drama on Bali in the seventies and eighties, it is still popular today. Topeng is a dance form in which all of it’s dancers are wearing masks. 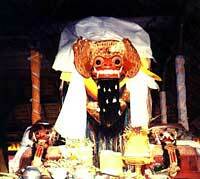 On Bali the word topeng means a dance-drama form, while Indonesian topeng means mask, Balinese for mask is tapel. This dance-drama usually tells the story of Javanese and Balinese courts. The dance of the Topeng is refined and flowing, it seems like the dancers are enjoying the act of dancing itself, and it flows slowly and not in a hurry. Topeng is mostly danced by men. One of the Topeng dances is called Topeng Pajegan, a dance of many characters played by a man who utilizes and changes many masks during the performance. Surely this dance form of Topeng is only for a dancer with good dancing skills and pure mind and concentration. This dance is for ritual purposes, the mask for the last character is called Sidakarya, with one of the character tasks to finish a certain ceremony. Another form of dance-drama which also utilizes masks for their characters is called Wayang Wong. The story is from Ramayana, the great Indian epic. 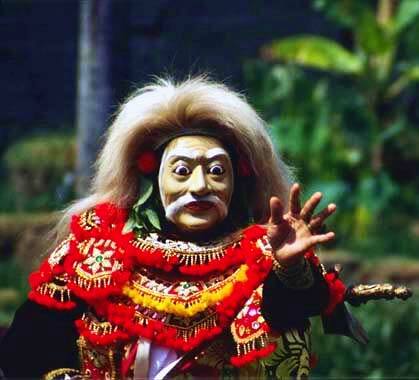 Some of the dances are considered holy and magical, like Barong and Rangda for instance, the origin of this sacred masked dance-drama is not clear. For exorcist functions, this dance may have an origin before the Hindu period, but there is also a possibility, like some examples of the modern dances above, that this play was created in a much later time. The Sanghyang magical dance is very old as well, and also intended for exorcist rituals. Holy ritualistic dances such as Baris Gede, with a number of dancers that can reach 80 people, and Rejang and Mendet dances probably have an ancient origin as well. In addition to the above, Bali has many other dance forms. The dance that is accompanied by Genggong music, a kind of bamboo harp music played by the mouth, is one example. There is also Selonding, a musical instrument made of iron, with an accompanied dance, Gegenjekan. This is a kind of spontaneous social dance with oral music, danced when drinking tuak, Balinese beer. Joged is a social dance accompanied by bamboo percussion music. In the old days, watching an Arja performance needed a lot of stamina. The play lasted until long after midnight, often until the early morning. The play flows from one scene to another with the sweet sound of singing by the dancers. This dance drama is one of the most artistic performing arts Bali have produced. Arja plays Balinese folklore as well as stories of Javanese princes and princesses called Malat or Panji. This dance drama form is a direct derivative of the older Gambuh play. Gambuh dancers utilized articulated voice of words, whereas Arja dancers are singing and conversing. This act of singing is mostly done while dancing or acting a role of a play. Before the dancer appear, he or she will sing and shake the curtain for quite a while, apparently to test the patience of the audience. The music for Arja is called Guntang or Geguntangan, a collection of simple percussion instruments made of bamboo and bronze, added to this is small drums. The sound of the instruments is clear yet sometimes tranquil and meditative. In the seventies Arja declined in popularity, mostly due to the growing popularity of other dance-drama forms like Sendratari and Drama Gong, the new dance dramas with Gong kebyar music. Now we can see Arja performances occasionally in the festivals and on commissions by Balinese, for rituals and other purposes, or by tourists. Like most of the things on Bali, Arja is also experiencing new energy and creativity. Beside many plays performed these days, the hundreds of years old all male Arja is also revived. Not everyone on Bali have the same understanding of the word Legong. Until today some Balinese seem to think that Legong is any non-dramatic dance performed by women. One of the reasons for this is the popularity of Kebyar dances that become so popular on Bali after the Legong era. The word Legong Kraton, meaning ‘Legong of the palace’, is instead often used by the Balinese referring to all repertoires of Legong. After a peak in the beginning of the 20th century Legong faded in popularity, but slowly and quite encouraging Legong has recently regained it’s popularity and dignity once more. This is partly because of the tourism industry and partly because of the work of individuals, organizations or even local governments who have had a special interest in Legong. They do Legong exercises, perform it on Bali Art Festivals, or at other Legong festivals. But one thing is certain, the beauty and charm of this delicate and feminine dance is indisputable. It’s hard to find any dance on Bali or in other places that is comparable to the grace and beauty of the Legong! Beside the dance itself, many of the musical compositions that accompany it is among the sweetest and most beautiful on the island. Original music for Legong accompaniment is gamelan pelegongan, a kind of percussion instruments with bronze keys, cymbals, and drums, although it can also be accompanied by gamelan gong kebyar, the modern gamelan of Bali. The dancers start dancing for the public at a very early age. Traditionally they are selected among young girls in the village for their subtleness and beauty. They will go on dancing Legong until the age of puberty, before they start dancing other dances. Usually excellent Legong dancers are respected as master dancers at older age and some of them also become respected dancing teachers. The stage of the Legong, as for many other dances and dramas on Bali, is called kalangan in Balinese. This is an open space with a kind of horse shoe half circle created by the spectators. With a big tree, usually an enormous banyan tree that overshadows the stage, and an elevated beautiful carved candi bentar gate as the back drop, from where the dancers emerge, the stage is complete. Watching a Legong performance in such a place under a moonlight at night is quite an experience, for some, this also means a revelation. Up to now, at least eighteen forms of Legong has been recorded. Some of them have been successfully revived only recently, and some are almost as popular as the Kebyar dance. Some examples of Legong dances are lasem, kupu-kupu tarum, jobog, kuntul, legod bawa, smaradhana, andir and condong. Some villages in Central and Southern Bali are considered to be home of the Legong. They are Peliatan, Ubud, Saba, Bedulu, Sukawati in Gianyar area, Binoh in Badung area, Kerambitan in Tabanan area and some others. These villages posses long Legong traditions, and most of them still have high quality Legong troupes. Some Balinese dances are now labeled as ‘classic’. This classic label is only presented to an arts form that posses exceptional quality and endurance to survive in many generations, and Legong is one of them. Meanwhile, the story of the birth of Legong is no less intriguing than the Legong itself. In early nineteenth century, a prince in Sukawati was in a coma condition caused by his illness. In his coma he saw two beautiful nymphs dancing a feminine and delicate dance. Not only did he see the dance, he heard the sound of the music that accompanied it as well, and was struck by the mysterious and beautiful sight and sound. After his health revival, together with artists of the village, he transformed his imagination into reality. So the Legong was born, another performing arts form on the already arts fertile island. At first Legong, as well as other dances at the time, allowed only male dancers. Many decades later, and up to this day female dancers brought the Legong dance to new heights. looking for information on Bali dancers for a nursing home.